From the popular fantasy FROST Series, comes Logan's story in The Wolf Fey. Logan is The Wolf Prince, and is one of the shifter fairies - fairies who can shift into wolf shape. 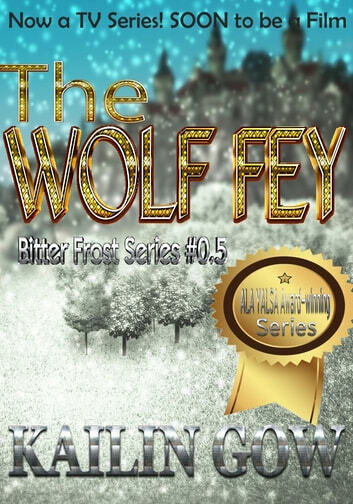 The Wolf Fey is Logan's open and raw story before Bitter Frost (Frost #1) about the Wolf Fey, and a hint of his destiny. Will it be with Breena? This is a novelette introducing a new werewolf mythology based on the concept that werewolves have fairy blood in them in order to help them shift. This is their magic. *** Bitter Frost Series *** Complete and Available! Lovers of fairy fiction will love the Bitter Frost series that is what the film will be based on. I can't wait. I am a long time fan of this prolific and imaginative author, who I dub the Patterson of fantasy, romance, and genre fiction since she is prolific and versatile like Patterson. I love anything Kailin Gow writes. Her fiction books always takes me into another world, whether it is fantasy, thriller, horror, or contemporary. I am in love with her world building and her strong female heroine. They are feminine beautiful and strong, a good model for the modern woman.